They are not easy to get to using public transport, so going there with a knowledgeable guide like Daniele is the ideal way to visit them. Daniele picked us up after lunch outside our rented apartment in Montesilvano. First we came to the Cistercian abbey of Santa Maria d’Arabona in Manoppello. Next we saw the beautiful abbey of San Liberatore a Majella in Serramonacesca. 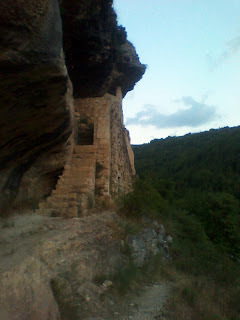 We took the enchanting path behind the abbey along the Alento River past ancient rock tombs, pools and little waterfalls. The striking church of Saints Valentino and Damiano with its twin belltowers is in the gorgeous hill town of San Valentino. The church, which was built from stone from the Majella in the second half of the 18th century, was designed by the noted architect Luigi Vanvitelli, who also designed the palace at Caserta near Naples. In front of the church, between the two flights of steps which lead to its door, is the lovely Fountain of Sansone. If you are ever in the little hill-town of San Valentino, I recommend that you taste their homemade ice-cream 'Crema di San Valentino'. 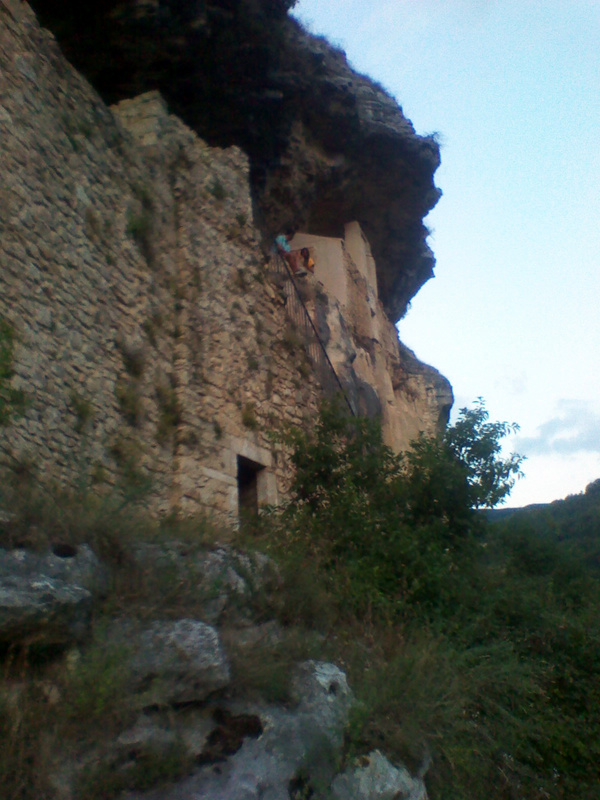 The picturesque hermitage of Eremo Santo Spirito is immersed in the fabulous scenery of the Majella Mountains. Unfortunately it was closed when we got there. Had it been open we would have been able to see a simple church, sacristy, monastic complex, chapter hall, library, winter chapel and refectory. Celestine V lived there from 1274 to 1276 before he became Pope. With a car you can drive to within 100 metres of this hermitage. We had a very enjoyable half hour walk through the Majella National Park on the way to the Hermitage of San Bartolomeo, which was the highlight of our trip. It is in an isolated spot but the walk there is not too difficult and the landscape is absolutely stunning. The hermitages rises beneath a rocky spur that covers it completely. The refuge itself can also be reached from the other side by a 'sacred staircase'. The only furnishings inside are the simple altar holding a statue of Saint Bartolomeo and a few wooden chairs along the side walls. When we arrived the only other person there was a mysterious, bearded, long haired, barefoot man dressed in orange robes. He pointed to my camera and waved his finger as if to say not to photograph him. He had piercing brown eyes that I will never forget. He had lit some incense inside the small chapel which wafted through the air and contributed to the atmosphere of calm. I kept my sunglasses on inside because my eyes were welling up with tears with the indescribable sense of peace that I felt there. This place has an ancient energy and being there was truly a spiritual experience. For more information about this hermitage, go to Sammy's blog www.lifeinabruzzo.com where she wrote a superb detailed account of her visit to the Hermitage of San Bartolomeo. Noel from www.abruzzo.com added exquisite close-up photos of the wildflowers and butterflies that he took the time to photograph along the way in his post entitled 'A Sanctuary in the Majella'. Thank you very much for bringing back memories of very special places of Abruzzo! I've visited the Eremo of Santo Spirito this summer and was really enchanted by the place. Thank you Tatiana. Beautiful Abruzzo has so many special places. Delighted to hear that you visited the Eremo of Santo Spirito this summer. Was it open when you were there? Unfortunately, the church was closed because it was decorated for a wedding and they were afraid that the bambini will destroy everything! But I don't think that they would do any harm. They were noisy but very polite and religiously educated. What a great excursion. Italy just never ceases to amaze with all of its wonders. Your own tour of Tuscany in the spring sounds absolutely fantastic Janie; staying in Lucca and visiting Florence, Garfagnana, Barga and Pistoia - Wow!